This festival just keeps getting bigger and better each year, this being the best yet in spite of colder temperature and lighter wind than in the two previous years. Once again everything came together like clock work, due to the fine organization by Linda Underwood and her great staff. All of the hard work put in by the coordinating committee put together a great fest with 60 World-class kite flyers, 28 of them from outside the US. This gives you the combination for a World Class International Kite Festival at its very best. And once again this was exactly what it was, from day one right up to the very last minute. The one thing that really amazes me is the tens of thousands of Madison residents that come out to support the festival. Madison has a population of around 200,000 people, and at any given time in the beautiful Monona Terrace Community and Convention Center was wall-to-wall people. They enjoyed the workshops, displays and exhibitions plus the very spectacular and majestic theatrical performances of indoor flying by some of the worlds best indoor flyers. It looked like everyone in Madison was there! Add on the thousands of spectators that were on the ice, and this festival must be by far the most supported kite festival in North America. 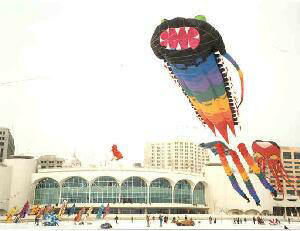 It has the very unique flavor of European kite festivals, which are family oriented. It is a wonderful feeling to see the excitement in the children’s faces, and the real bonus for me is when people and families seek you out to thank you personally for the show and for coming to Madison. Saturday was by far the best day, with great wind, which pleased all the kite flyers. Jody McCann, the Sport Kite show coordinator, once again did a super job in organizing the sport kite demonstrations. The performers each in turn had the thousands of spectators spellbound with their performances choreographed to music. It is a great pleasure and honor to share the Sport Kite ice arena with such talented World Class flyers whom give there all to entertain the citizens of Madison with their beautifully choreographed routines, and seeing it from the spectators perspective it is like looking onto a huge gigantic stage, with the sunshine as the stage lighting and the sky above the stage and beyond filled with some of the world’s finest single line kites of every description color and form swaying gently as if they are dancing to the music that can be heard all over the 4,000 acre magnificent and beautiful Lake Monona. The Saturday wind blew all day right on though the night fly. What a magnificent sight to behold, the night sky was filled with kites of every description. I don’t think there was a kite left in anyone’s kite bag, every kite was in the sky being illuminated by all the different light systems, and for sure every one from Madison was out in full force to watch. For many, this was a once in a lifetime sight. To make more of a visual impact, a light snow was falling. The different lighting, making it look like confetti, added a theatrical effect courtesy of Mother Nature! If this was not enough for you, at the end of the event the sky became illuminated with a ten-minute spectacular fireworks show. What a great climax to a perfect night fly and a awesome day’s flying! We were all a bit behind schedule as we all were very reluctant to leave the night fly, and had to really pack up in a big hurry as we did not want to be late for the banquet. It turned out to be a great evening, it is great to unwind and relax socializing with flyers, some of whom I had only met a few months ago at other kite festivals in another part of the world. The banquet food was fit for a King. On Sunday everyone was again on the ice early ready for another great day, but alas the wind was very light. In spite of the lack of wind, everyone did their best to entertain the thousands of spectators who seemed not to notice the lack of wind. This shows expertise and professionalism at its very best, the Show Must Go On! The Sunday evening farewell dinner was held as usual at the Essen Haus German restaurant. The Essen Haus serves many excellent varieties of beerJ, and once again we played the game that has become a custom at Kites On Ice, “Boot Drinking”. The way the German Team “No Limit” was knocking it back, it looked like they had been practicing all year to try beating the 1999 and 2000 “Boot Drinking Champions”, the Decorators. The Decs won it again this yearJ. Once again on behalf of each and every guest kite flyer I would like to take this opportunity to thank the many sponsors of Kites On Ice for making this unique Kite Festival happen. Thanks also to the City of Madison and its citizens for making each and every one of us feel so very welcome, Craig Wilson who proved to be quite a Dreamer, and last but not least Linda Underwood and her side kick Kristy Kent-Bracken plus all of the great volunteers. They proved that Dreams can come true. Congratulations, you did it again with flying colors. My wife Gerri and I have known Ray for many years and shared many flying fields across southern and northern California, Washington State, Oregon, Hawaii and also at the last four AKA conventions. We have had the pleasure of crewing for him many times and, I might add, he is not your average flyer to crew for — far from it. He’s very fussy. Everything must be precise: selecting the right place in the arena to set up his kites, spacing the kites a specific distance apart, rechecking each kite not once but several times. Just when I think — that’s it — Ray comes running over to check them himself. This used to get under my skin a little, until I realized what Ray is up against in his multiple kite ballets. One little mistake and it is game over. One thing I have learned is to never lose eye contact with him while setting up his kites. Ray uses hand signals for us to reposition the kites. As you know, he usually flies shirtless. This makes him very sensitive to the slightest change in the wind. I am very proud to say that Gerri and I must have served our apprenticeships well as we are now his official crew team when we are together. 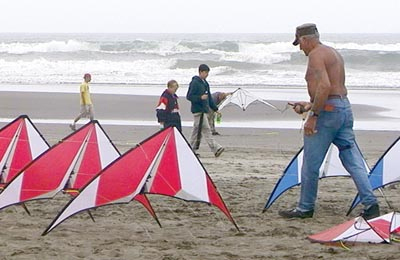 Many of us had heard rumors that Ray was going to attempt something special at the infamous Long Beach, Washington State International Kite Festival. Little did we know that Ray was scheming to set a new world record. For months, it had been a secret between Ray and Mark Reed, president of Prism Designs Inc. During dinner Wednesday evening, Ray suddenly said, “Fred, tomorrow morning with your help I am going to give it a go.” He filled me in about what he had in mind, to fly 3 stacks of Prism’s Fanatic kites. He said his last stack record was 3 stacks of 4, a total of 12 kites in 1997, and that he wanted to start this one with 15 kites 3 sets of 5, then go up from there. When I arrived at the beach the next morning, Ray was already flying three Prism Legacies. The wind was very light, around 2.5 mph. Meanwhile, Mark and his crew were adding train lines to the Fanatics, setting the bridle, etc. When they were all set up Mark launched a stack to see how they would fly. They were a little wobbly. Then Ray landed the Legacies and came over. Between them they flew and adjusted the kite stacks until Ray was satisfied. He gave Mark the thumbs up and said, “Lets do it.” I asked Ray if he would like to use my new sets of 200 lb Blue Line that I had just made up the previous day. Ray answered with his standard reply when he is pleased, “Good stuff, Fred.” By this time a large group of kite flyers and spectators had gathered. The Prism crew set 3 stacks of 5 kites on the beach. The wind now was 5 mph. Ray had three assistants in addition to the Prism crew: Colby Gratzer, Craig Robbibaro and myself, with Andy Tauber as the official time keeper. Ray was ready and so were the kites and the crews. Mark Reed sent a runner up to let the officials know that it was a go and it was announced over the speaker system that Ray was going to attempt to break his 1997 stack record. Everyone was watching Ray. The 3 stacks of kites looked great, poised and ready for take off, one stack blue and white, one red white and blue and the other red and white. Ray gave the thumbs up sign. Up went the center stack, followed by the left and right hand stacks. It was very impressive, and a great round of applause arose from the spectators. Videorecorders and cameras were in full swing. Ray did all the compulsory maneuvers: passes, dives, wraps, etc., then came in for a perfect 1-2-3 landing. Ray had broken his 1997 record, but it is not all over yet! The Prism crew reset the stacks again. Ray gave a hand signal to the crew to add 3 more kites: 3 stacks of 6 kites, a total of 18. The wind had increased to 7 mph. Another announcement was broadcasted over the PA system. Thumbs up from Ray, and up went the center stack. He flew it around for a few seconds controlled by his waist, then put the stack into a dive right between the right and left stacks at the same time. As he reversed the dive into a climb he launched the left and right stack. Spectators whistled, shouted and applauded with delight. Once again he did all the qualifying maneuvers plus many of his own, and landed with another perfect 1-2-3 landing. People were waving and shouting and coming over to congratulate him, but before they could get to him he signaled the Prism crew to reset them again, and add 3 more kites, which now will make 3 stacks of 7 a total of 21 kites. You could literally feel the excitement. If he succeeds, he will have broken 3 of his own records. This time there was complete silence among the spectators; and it seemed as though they were holding their breath. The last 3 kites were attached, and the crew gave Ray the thumbs up. I heard Ray remark to Mark Reed, “If I pull this off the beer is on you tonight.” Mark smiled, and replied with the thumbs up sign. Ray was now fully focused on the 3 stacks, you could have cut his concentration with a knife. All of a sudden, up went the center stack. Ray was leaning way back as he turned the stack into a dive turning up at the very last second and at the same time launching the left and right stacks. There was a massive sigh of relief from the spectators and then a huge burst of applause. What a magnificent sight it was to see these 3 stacks flying synchronized and in complete harmony with each other! One of the maneuvers that always amazes me is his hover mode. He stacks the kites above each other at the very edge of the wind window for a few seconds, then each one in turn breaks off into follow the leader maneuver. It is such a clean and precise maneuver, and so hard to believe this is being performed by one person, not a team. Ray did all the qualifying maneuvers once again plus many of his own. After exceeding the required air time he brought them into another perfect 1-2-3 landing. The huge crowd of spectators showed their appreciation with hand shakes hugs, applause, waving… you name it, he got it. Cameras and videorecorders were clicking away. Spectators wanted their photo taken with him and many asked him to sign their festival programs. This, I am positive, is reward enough for Ray. He has achieved what he had set out to do plus he got the big added bonus: the joy of receiving the generous appreciation of the spectators, and his fellow flyers. Well done Ray, and to use your own expression, “Good Stuff Mate!” Thank you for letting us: Colby, Craig, Andy and myself to be a part of this very special event. 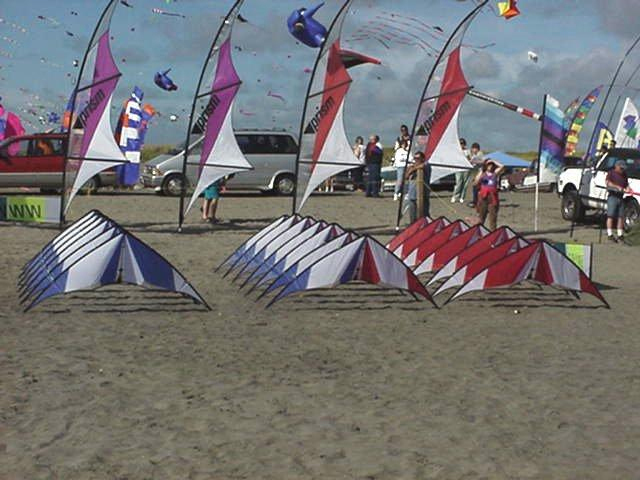 The 21 kites were on display at the Prism demonstration area and later sold, with Ray’s autograph on them. 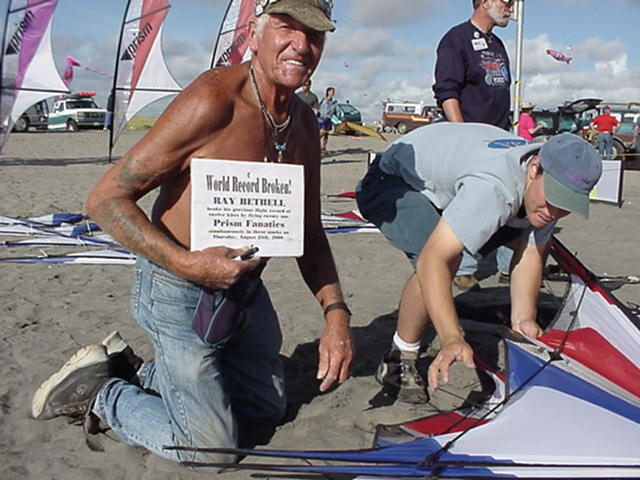 Ray also flew them individually the next day at the request of many who were lucky enough to have been able to obtain one or more of the kites that were used in the very successful world record attempt. 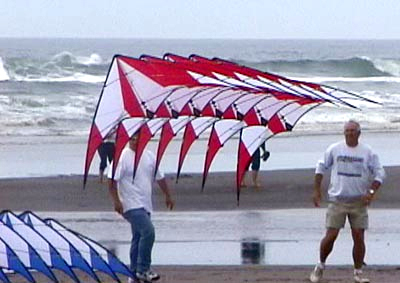 Many people were disappointed in not getting one of these Fanatic kites as a souvenir of Ray’s achievement in setting a new record. Gerri and I were very fortunate to have been able to get three of these kites which will be displayed along with this article and photographs at our place of business to show our staff, customers and friends yet another aspect in the world of kite flying. It was a few short months ago, on a beautiful autumn day that I was at Vanier Park with my kite. Ray was there in his usual spot, thrilling passers-by with his flying. After flying for a while, the wind dropped off and I stood in the sunshine talking with Ray about kiting and whatever else came to mind. I mentioned to Ray that I was a website developer and he asked me what I thought of his site. I told him that I thought that it was pretty good, lots of interesting articles that made for great reading but the site was in urgent need of some updating. I then offered to help him out with his site if he wanted it. He said he was interested and would like to talk about it on another day, as he had to head off home. As it turned out, we didn’t have opportunity to speak again for several weeks which was fine for me as it allowed some time to think about what could be done with his website. After much consideration I felt that it would be best to do a ground-up rebuild. I had no idea what Ray would think of this, but after several years of developing websites I knew that this would be the best approach. I ran into Ray again at Vanier Park a few weeks later and we decided to get together the next day to discuss his site. Sitting in his home office, I explained my ideas to Ray and suggested that we build a completely new site. Ray was concerned about the cost of doing such a site but I told him that I was more than willing to take on the task as a diversion to my everyday work, and looked forward to building a site about kite flying. In return, Ray offered to coach a friend and I in Team Pairs flying (to say the least, I was very excited to be coached by one of the best kite fliers on the planet). I knew that I had to build a web presence that would adequately portray Ray’s kindhearted spirit and his love of kiting. The first order of business was to determine goals for the site. Together, we sat down and decided on three main objectives. 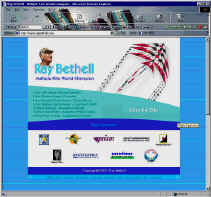 The site would be used to promote Ray and his flying skills, promote all of his sponsors, and promote kite flying to the world. From there, we discussed what type of content should be included to best meet our criteria. Ray had some very specific requests, all of which were well-founded and reinforced Ray’s caring nature of being fair and grateful to all those who have helped him along the way to become a world champion kite flyer. I was beginning to think that building a site for Ray was going to be much more than just putting a bunch of web pages together. I was right, and it would turn out to be one of the most satisfying web projects that I have ever worked on. After figuring out the structure and navigation for the site, it was time to begin gathering information about Ray to fill the pages. We talked at great length in meetings at Ray’s house. E-mails were squirted back and forth over the web at an amazing rate (over 500 e-mails passed in three months!). And we spent quite a number of days at Vanier Park flying kites while I questioned Ray about his achievements and travels. I learned that Ray can tell some really great stories, each of them showing his sense of humour and adventure, his compassion for people, his love of kite flying, and his incredible talent of making people everywhere feel special. At times it took a fair bit of prodding to get Ray to talk about himself since he’s so very humble, but a shot or two of twelve year old single malt every now and then made it a lot easier. The final result is a website of more than 150 pages. In it, you’ll find information about Ray and his phenomenal number of achievements (many of you who have known Ray for some time may not be aware of how many there are — be sure to see Ray’s Records and Awards section, I’m certain you’ll agree that it is very impressive). There’s information about Ray’s sponsors, his kite team friends, organizations and clubs that he belongs to, letters and poems that have been sent to Ray from around the world, a guest book where you can leave a message for Ray, and of course, all the great stories that Ray has written about his kite flying world adventures. You’ll also find information about Ray’s kite collection with reviews that Ray has written for each of them, as well as basic kite flying tips for newcomers getting into sport kiting. Just for fun, we’ve added some images that you can download and use as wallpaper on your computer desktop. We’ve also got lots of good stuff planned for down the road, so be sure to add your name to Ray’s e-mail list and we’ll notify you of updates and additions to the site. And there’s more… one of the challenges of building the site was trying to get photographs of Ray at different festivals. Ray has a few photos that people have sent to him and a few people allowed us to use images that we found on the web, but there is a definite need for us to build an archive of photos for the site. We decided to ask people to send us their photos of Ray over the web. To do this we are having a contest and will enter everyone who sends a photo that we use, into a draw for the same kite that Ray used to set his latest world record. A phone call to Mark Reed at Prism to explain what we were trying to accomplish resulted in a brand new ready-to-fly Prism Fanatic being donated for this purpose (thanks to Jeremy and all the folks at Prism for all your help). As an extra bonus, Ray will be including one of his very sought-after handmade kite stakes. So get those photos of Ray out of that shoebox and send them to us. You could be flying a brand new kite before long. It’s been a genuine pleasure getting to know, and to work with Ray on his new site. I hope that you’ll find it as enjoyable to visit as it has been for me to build. And please, be sure to leave a message in Ray’s guestbook. I’d like to say thank you to the following for giving your generous permission to use your photos and articles on the website: Jeremy Perceval, Alec Marshall, Mike Gillard, Paul Champie, Felix Mottram, Dominik Jasper, Sam Eaton, Prism Designs, Larry Bush, Ray Oakhill, Richard Nourse, Peter Taylor, Lindsay Carlson, Charles Stonestreet, Craig Rodgerson, Dorothy Jones, Fred Adler, and the many others who sent logos and other information to Ray to pass on to me. And thank you Ray, for showing the world how to fly. This entry was posted in 2001, Issue 21 (Mar), KL Archive. Bookmark the permalink.